Solomon Islands Prime Minister Rick Houenipwela has initiated a new proposal with his PNG counterpart Peter O’Neil, which will see PNG providing financial support towards the Pacific Games. 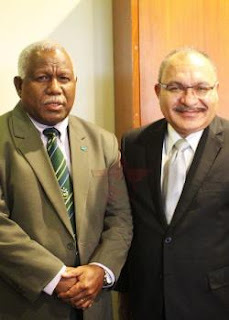 Both Prime Ministers met Tuesday for bilateral talks and agreed for PNG to redirect a portion of its grant assistance of K40 million(US$12 million) to help build infrastructures and provide technical assistance to Solomon Islands for the 2023 Games. This will be subject to joint consultations between both parties. Prime Minister Houenipwela has acknowledged that Solomon Islands can learn a lot from PNG following their successful hosting of the Games in Port Moresby in 2015. Houeniwpela said this grant can be put to good use if it is redirected to infrastructure projects like the Pacific Games rather than on untied commitments like in the past. “We appreciate and acknowledge budget support to Solomon Islands over the years and believe this grant can be utilized more through tangible and impact projects,” Prime Minister Houenipwela said. PNG Prime Minister Peter O’Neil in response has welcomed the initiative by the Solomon Islands Prime Minister. “PNG has a lot to offer in infrastructure development and are prepared to assist Solomon Islands in its preparations towards the 2023 Games,” he said. Prime Minister O’Neil said he will send his Sports & APEC Minister and his team next month to start identifying areas and meet with Solomon Island officials to kick off this initiative. The PNG Prime Minister has also encouraged the Solomon Islands Government and people to work together to successfully deliver the 2023 Games and to avoid last minute preparations. “PNG stands ready to support Solomon Islands,” Prime Minister O’Neil assured Prime Minister Houenipwela. Meanwhile, both leaders have also acknowledged the long and cordial relationship shared between the two countries. Both leaders have also acknowledged that there should also be more emphasis on the trade and investment opportunities shared and the people to people connections. Prime Minister Houenipwela and Prime Minister O’Neil have also agreed to fast track the technical development and cooperation framework between the two countries. This will guide the formulation of future memorandum of understanding for sustainability of selected industries and sectors for economic growth.